Monday morning I was awakened at 4:45 by a rooster crowing. As I fumbled in the dark to find the earplugs I packed, I offered a telepathic message to the noise-maker. "Rooster, dear, I need you to get it together. It is still dark. Calm down. Shut your yap." After a few more hours of fitful dozing, I got up and made myself somewhat presentable for breakfast. Post-breakfast, I scolded the rooster aloud when we met up in the parking lot, suggesting he might want to visit a therapist about his anxiety-fueled vocalizations. Chad and I walked down Simonton Street toward the Key West Art & History Museum. We passed the usual T-shirt shops, cafes, day spas and bars along the way. One establishment that caught my attention in particular was the shopfront for Pirate Costumes of Key West & Key West Weddings. If you have your wedding on Key West it should be pirate themed? Clearly. The Key West Art & History Museum is air-conditioned, not crowded and hosts interesting stuff to look at and read. We lingered and looked at EVERYTHING in that lovely air-conditioning. The exhibit on Hemingway's time in Key West mostly revolved around his fishing adventures. The exhibit on Key West's role in the Civil War was pretty interesting. Key West was actually a Union stronghold! As we walked up the grand stairway, we looked at illustrated excerpts from The Old Man and the Sea. The second floor housed an exhibit and information about Henry Flagler & his role in bringing the Overseas Railroad to Key West, along with the unfortunate destruction of the railroad line during the 1935 Labor Day Hurricane. We also viewed works by folk artist, Mario Sanchez, many of which were wood carved in relief painted in bright colors with scenes of everyday life. After the museum, we walked back down Duval Street: the more raucous end of which should not be viewed, or smelled, in the good light of daytime. We bought a coconut from a stand to drink. The proprietor of the stand drilled a small hole in the top for a straw. The coconut juice was yummy, but warm. File my suggestion to refrigerate the coconuts under "first world problems". After a brief stop at our hotel room to cool off, we walked farther down the quiet end of Duval Street to the Banana Cafe for lunch. The Banana Cafe has a French theme to the menu. I had a veggie baguette. Chad had a crepe with a green salad on top. The food was simple with fresh ingredients. Walking back to the hotel after lunch, I heard a noise coming from the bushes as I walked by them. I said to Chad, "There is something angry in those bushes." Upon closer inspection, I realized that the angry cluck came from a mama hen with her brood of ten baby chicks! They were so stinking cute! Later in the afternoon, we set out for a sunset snorkeling cruise with Fury Water Adventures. The crew members of the boat presented a perfect balance of fun and safety mindedness. Before setting out, the captain told us we would not be going to the barrier reef as planned due to three foot waves and low visibility. Instead we went to a shallow water shipwreck that only had six inch waves and much better visibility. The water was crystal clear, and the sunken ship served as a sort of reef. We saw clownfish, angelfish, grouper, a pufferfish and several kinds of coral. Chad spotted a big crab scuttling across the gulf floor. As we cruised back toward the dock after snorkeling, the boat captain turned the motor off for a few moments so we could watch the sunset. It was lovely, and our view was not blocked by a giant germ boat, I mean cruise ship. Snorkeling was my favorite activity during our trip to Key West. 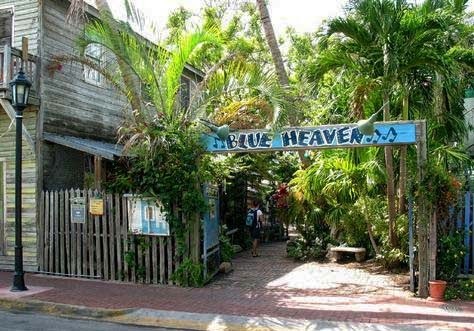 Tune in tomorrow (or maybe the next day, I get distracted) for more Key West travelogue featuring the Eco Discovery Center and Blue Heaven. 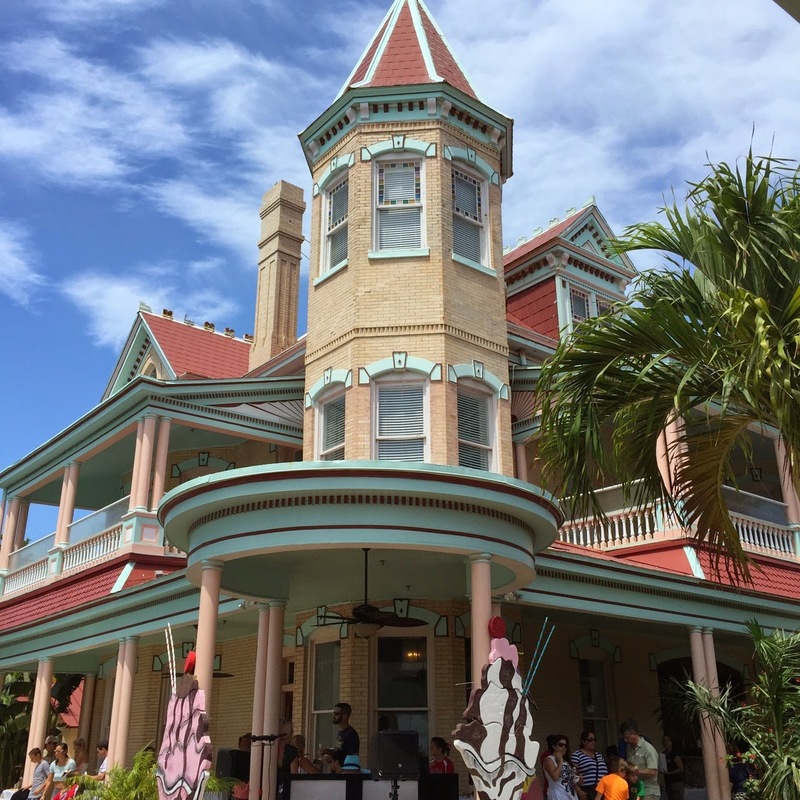 After breakfast at the hotel, we headed a few blocks south to Southernmost House for the 13th Annual Michelle's Willie Wonka Chocolate Festival to benefit the Cancer Foundation of the Florida Keys. For me, this was not about contributing to a noble cause, the festival flyer had me at "chocolate". A teenage guy wearing a polyester (that mess does not breathe, bless his heart) Willie Wonka costume greeted each guest, bravely smiling and directing guests to the chocolate fountains tent and baked goods as he handed out Golden Ticket stickers to wear for event entry. The chocolate festival boasted mostly baked goods and two different triple-tiered chocolate fountains. I sent a pretzel rod through the fountain. Chad opted for a banana. We shared. All was yum. 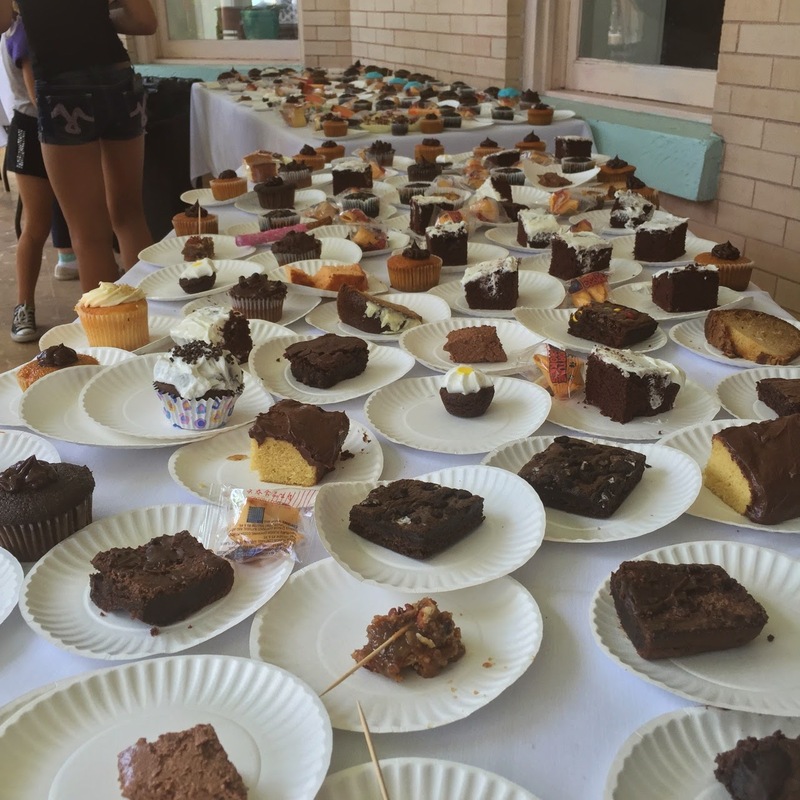 From the crazy buffet of baked goods, we shared a slice of chocolate layer cake and an oreo-flecked brownie. The treats were rich for such a hot day. Chad and I quipped that we would pay "tourist money" for pints of milk to wash down the sweets. We had to settle for bottled water at $1.00 each. Note to planners of future Wonka festivals, charge $5 for a pint of milk to raise even more money for your cause. Southernmost House is a beautiful old Victorian-style mansion complete with Candyland color scheme and a fairytale turret, which provided a nice backdrop for the Willie Wonka theme. After so much sweet stuff, we decided to move along. 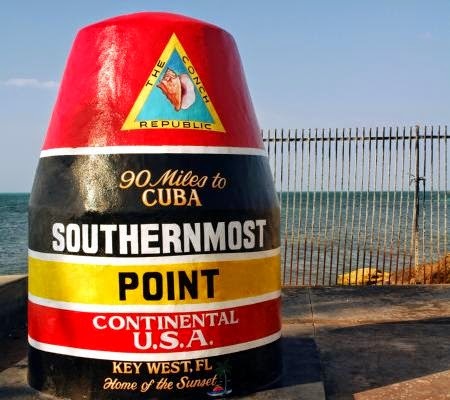 We rounded the street corner to an old sewer junction painted to look like a buoy that is known as Southernmost Point, meaning the southernmost point in the continental United States of America with only 90 miles over the Gulf of Mexico to Cuba. Chad and I did not stand in the long line stretching down the sidewalk to take a photo there. We're not big on selfies or on repeating postcard shots that everyone and their grandma take. It's enough that we were there and saw it. On our walk to the next stop for the day, Hemingway House, we saw a family of chickens scratching the ground for foodstuffs. The mama hen had three, gawky teenage chicks with her. They were a cute little family. This scene of free-roaming chicken families was to be repeated many times during our trip. *Click here* to read more about the chickens of Key West. Hemingway is not my favorite author by a long shot. I enjoyed The Old Man and the Sea reasonably well when I had to read it for school, but didn't like For Whom the Bell Tolls. I mostly just wanted to see the polydactyl descendants of Hemingway's cats. 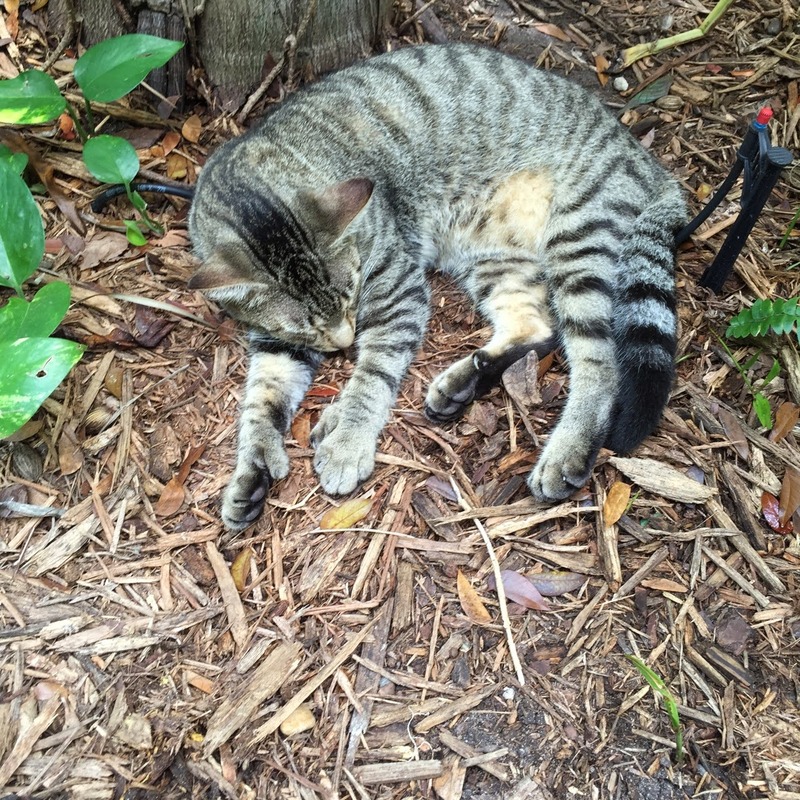 On the information-packed tour of the Hemingway House, we were regaled with the history of the house itself, some history of Key West, juicy scandals surrounding Hemingway and his many wives, and yes, lots of extra-toed cats. Ship's crew liked to have cats with big paws aboard to combat the rodent situation. Cats with extra toes were prized, and thought to be better mousers. A boat captain gifted a polydactyl cat to Hemingway, and he loved it. Approximately forty cats live at the Hemingway House today. The tour guides know each cat's name. They are well fed and have free reign of the place. A veterinarian visits twice a week to check on the cats. Most of the cats are spayed/neutered, but a few of the polydactyl ones are allowed to keep the bloodline going. One feline fellow even allowed me to pet him. This napping cat was perfectly posed with his extra toes on display. After our tour of the Hemingway House, we returned to the hotel to rest and try to stop sweating for a bit in the air conditioned room. Chad and I wandered over to Blackfin Bistro just around the corner from our hotel for a late lunch. Blackfin Bistro was pleasantly dark and cool, a respite from the scorching afternoon sun. The decor drew me inside with seed glass pendant lighting, weathered-looking shiplap boards on the bar front and clean lines. Blackfin Bistro was crowded when we passed by it earlier in the day, but we were the only customers there at 3:00. I love having a place to ourselves. I had a brie, apple, avocado sandwich. Chad had a fish sandwich. We both had mimosas with fresh squeezed orange juice. (Seriously saw the bartender squeezing oranges.) So good! Later in the evening Chad and I walked down to Mallory Square to watch the sunset. Chad and I share an uncomfortable avoidance of street performers, so we didn't stop to watch anyone juggle flaming things, breakdance or swallow swords. I know, we're both total buzzkills. Unfortunately, there was a huge cruise ship blocking the view of the sunset from Mallory Square. We got out of the ship's shadow by walking down the boardwalk to the Westin Resort Pier, where we stood on a low retaining wall to watch the sunset. It was pretty over the water, and seemed to sink quickly into the gulf. There was no fanfare, clapping or even "ooh"s or "ahh"s from the audience. I mention this to serve as a contrast to the sunset show at The Oasis restaurant in Austin. As the sun starts to set, a bell is rung, the sunset is announced, after a moment of watching the sun sink to Lake Travis on the horizon, clapping and hooting erupt seemingly spontaneously. Toasts are made. That's how you gratefully and festively observe a sunset, people! A sunset is not properly celebrated from behind a huge cruise ship that blocks the view of the horizon. Walking back towards our hotel from Mallory Square, we stopped for dinner at Mangoes on Duval Street, yet another outdoor seating establishment. I sometimes tire of being a vegetarian, and struggling to find meatless dishes at restaurants. It's like I'm stuck in a revolving door of: salad, veggie burger, bruschetta, caprese sandwich, when perusing menus. I had bruschetta and a salad for dinner. It was fine. Chad, however, was spoiled for choice as an omnivore who loves seafood. He had ceviche and liked it. Dessert was key lime pie (naturally) topped with a tiny shot of whipped cream to cut the tartness. 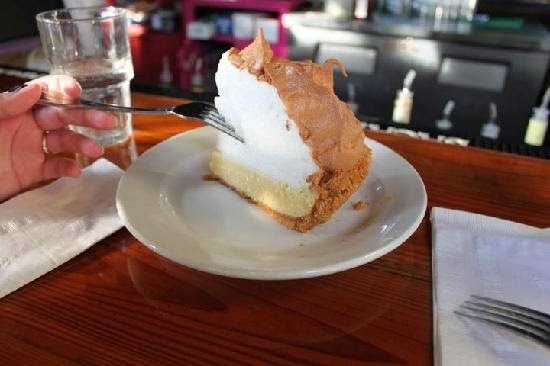 This key lime pie was not too sweet and not too tart -- just right. Gentle Readers, I am a jaded old soul. Very little is ever quiet as great as I think it will be despite constant attempts to manage my artfully high, crazy-creative expectations. I am an ambitious aesthete, always wanting more beauty, delight and surprise. It's my bedazzled albatross to bear. If sometimes my take on places and events seems overly critical and underwhelmed, I own it. This serves as my disclaimer that while not every aspect of our Key West vacation was dazzling, I really liked it overall. 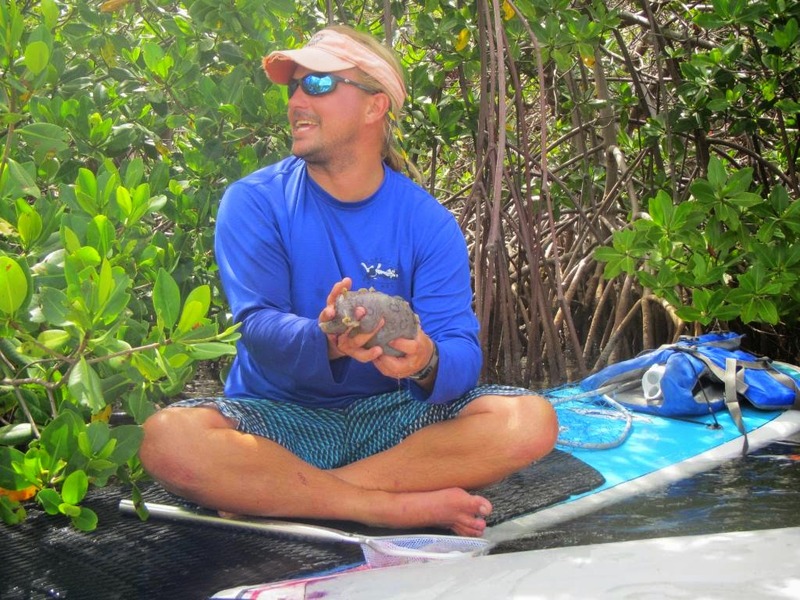 Tune in tomorrow for more Key West travelogue and tales of sunset snorkeling. 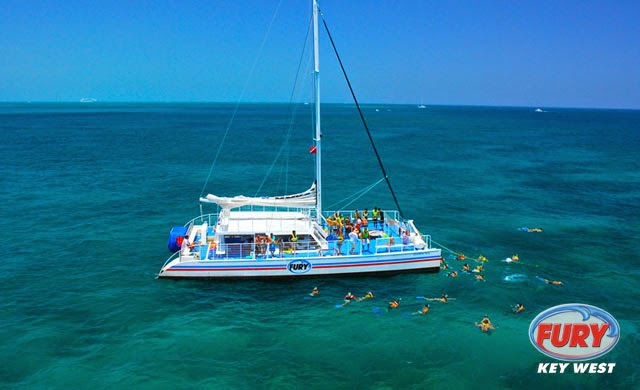 To plan our spring vacation I searched the interwebs for "best North American vacation for couples" and came up with Key West, because it offers great snorkeling, a relaxed atmosphere and might stay within budget. Chad loved the idea so much, that we booked flight and hotel within a few days of me suggesting Key West. 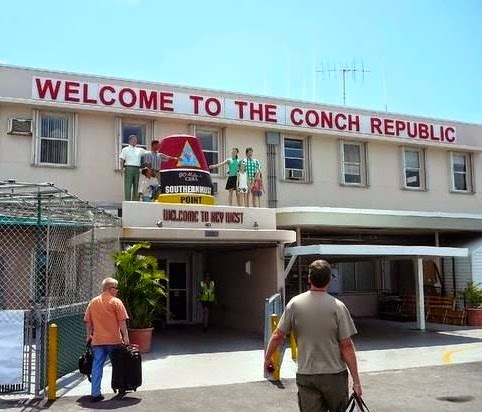 Luckily, these days flights to Key West are abundant. The Key West airport is small compared to most tourist town airports, and the runway is short. The pilot warned us that we would feel a rapid deceleration upon landing with the implication being "don't be scared/no screaming or crying back there". Disembarking from the airplane down wobbly stairs to the tarmac, we were greeted by a retro-looking sculpture of a buoy and some families pointing at the buoy, or maybe reaching for each other's hands. Um... does anyone else find this sculpture a little creepy? 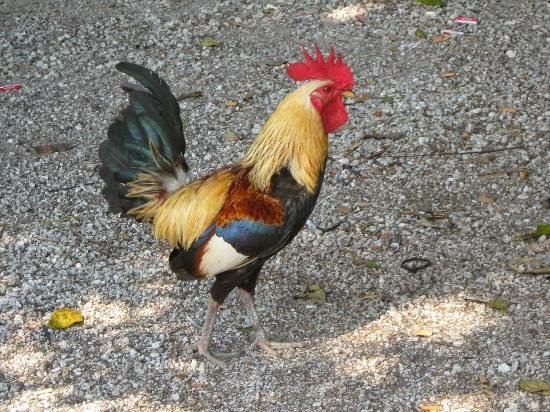 As we left the airport in a taxi bound for the hotel, I saw a big rooster sporting impressively colored plumage walking around near some picnic tables. When we arrived at our hotel another (or was it the same?!) big rooster sporting impressively colored plumage greeted us in the parking lot. There are many free roaming hens and roosters on Key West. More on that later. 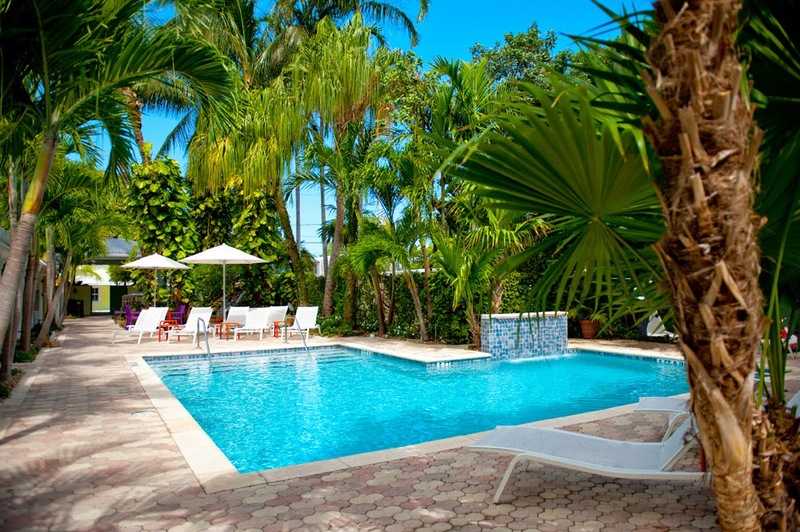 Chad and I often turn to tripadvisor for help deciding where to stay, dine and play, which is how we found the Almond Tree Inn for our stay in Key West. 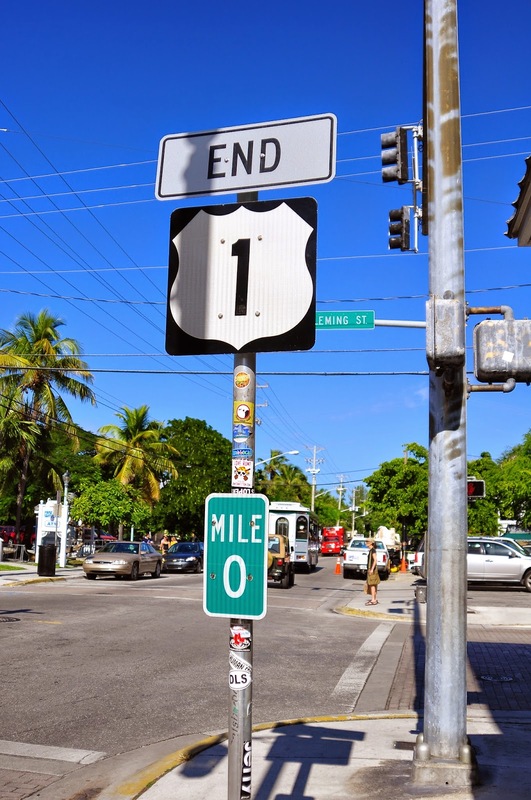 Located near the quiet end of Duval Street on Truman Avenue, we easily walked to all the things we wanted to see on Key West. (The island is only 1.8 miles by 4 miles in area, so most things are walkable.) 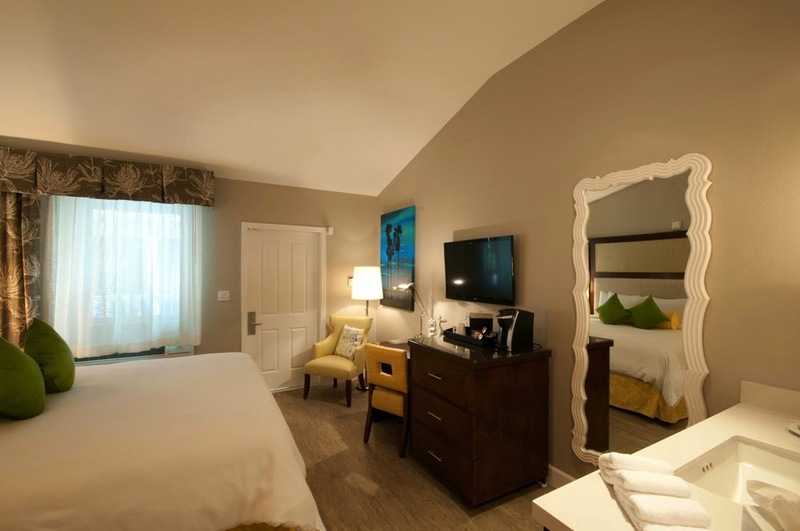 The rooms are thoughtfully appointed with Jonathan Adler-esque style. 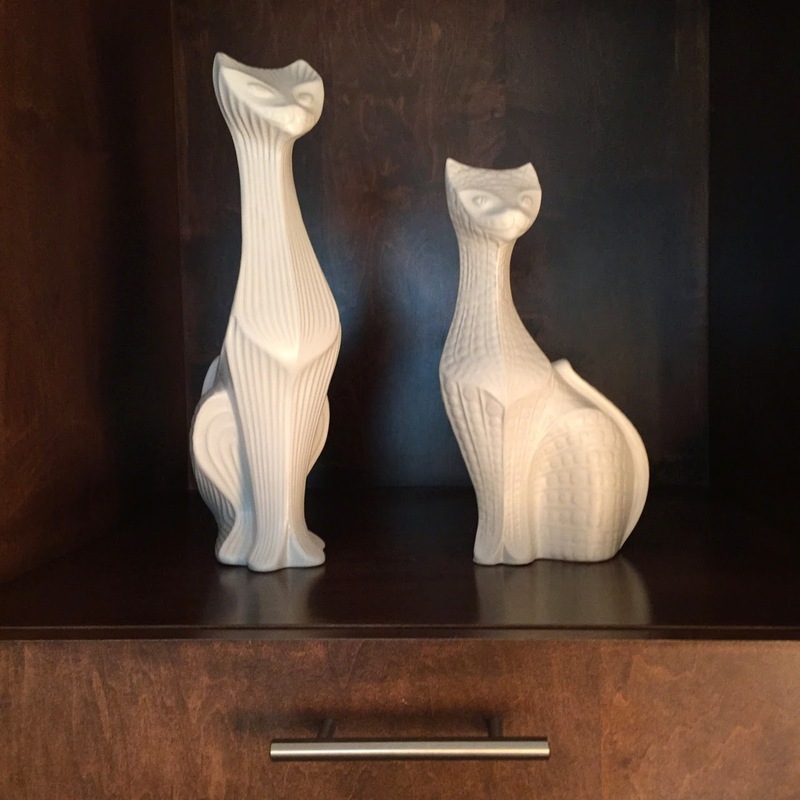 (Our room had cute cat ceramics on a feature shelf. It's like they knew me!) 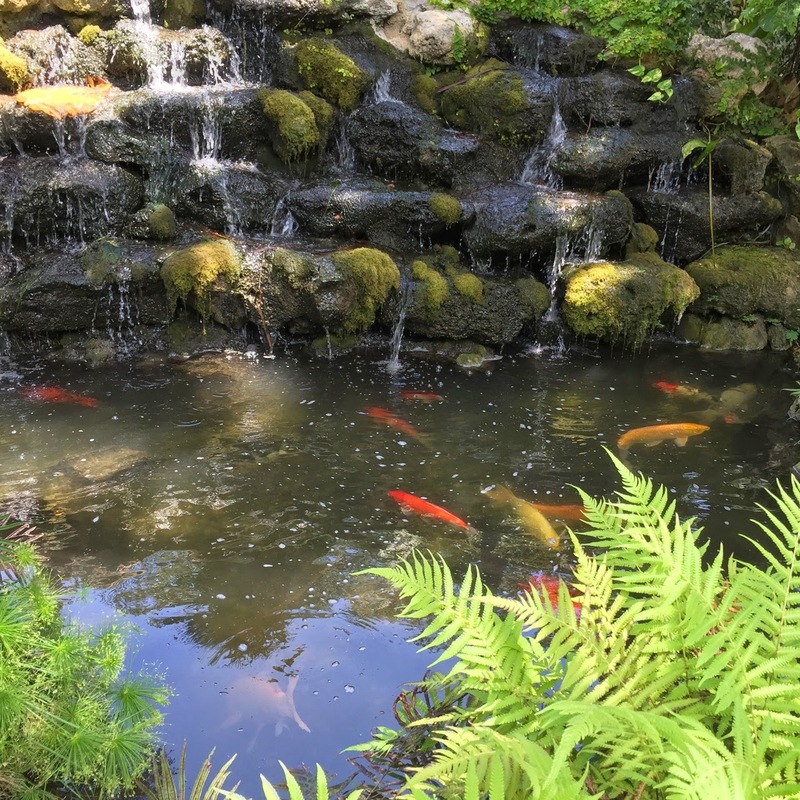 The hotel courtyard features a pool, a hot tub (no thanks, germs) and a man made waterfall with koi pond. An impressive continental style breakfast is served each morning on the lovely covered porch area. Happy Hour nibbles and drinks are served each evening. Our first evening in Key West we walked around Duval Street a bit to get acclimated, stopping for dinner at the downtown location of Cuban Coffee Queen. I liked my black bean veggie burger from Cuban Coffee Queen served with plantain chips and a blue dumdum lollipop for dessert. Chad loves all things breakfast/egg and had Havana rice and beans with eggs. He liked it, but did not get a lollipop. I tried to convince Chad that the staff wasn't playing favorites with the unequal lollipop distribution, but I was clearly their favorite. Or possibly the lollipops only come with sandwiches. Many of the restaurants in Key West, including the downtown location of Cuban Coffee Queen, have shaded or covered open air dining. It's hot and humid in Key West. If one holds still and there is a breeze, outdoor dining is semi-pleasant/semi-sweaty-making. After dinner, Chad and I had a lazy swim in the hotel pool to cool ourselves before bedtime. Tune in tomorrow for more Key West travel adventure tales.